Last week I decided to try the "Focus T25" workout for real. I bought it some time ago, to get some ideas for bodyweight routines, but I never really went by their prescribed schedule. Well, last Monday, I decided to follow their schedule and here's what I learned. 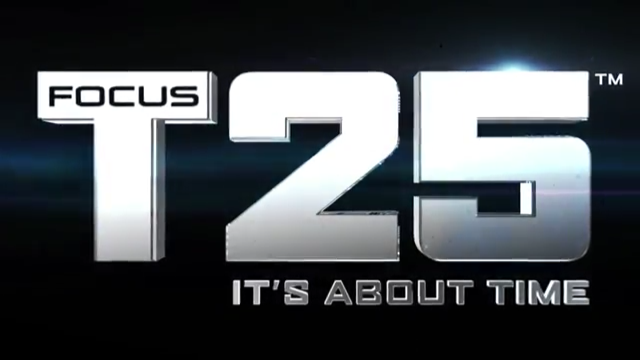 Focus T25 is one of many workouts led by "Shaun T". His workouts range from almost recreational (e.g., Hip Hop Abs) to quite challenging ("Insanity" and Focus T-25). Focus T25 includes different "rounds", which translate to different difficulty levels. The set I bought includes Alpha and Beta. There is also a Gamma level. The intensity of exercise goes up, as does the requirement for equipment. The premise of T25 is that with "just 25 minutes a day" you can get in amazing shape. Let's see if that holds true. When I bought T25, I called the company that produces it, Beachbody, directly. The call took a while and was a bit confusing as the operator tried various ways to forms words into sentences to imply, suggest, and equivocate with the goal of getting me to buy more. There were extra "levels", "deluxe" options (which I think was just another mat and elastomer band), and so on. I finally had to get into academic mode and cut to the chase. Once I did buy it, I had to deny various other attempts to sell me more stuff. It was too much. Lesson learned, buy products from Beachbody in a way that does not involve calling them and giving them any information. It's Not *Exactly* "25 minutes a day"
On Friday, you are asked to do two workouts, so it works out to more like an hour that day. They don't specify in the workout if they have to be back to back, but they do explain that if you need to do one over the weekend that is acceptable. On Sunday, you are asked to do the "Stretch" workout. It's actually a bit of a workout. You will use your muscles. I find it's akin to an intermediate Yoga class. The good news is that this can still be a good travel workout at all three levels if you pack some resistance bands. Enough Rest for Lower Legs? I actually started doing T25 workouts the week prior, but I did not try to do them in any special order and I did not do the double day Friday. When I started following the specific program this week, I found that my feet, calves and quads were tightening up rapidly. Throughout the various workouts there are a lot of exercises that include hopping or jumping while keeping your heels off the ground. The "Cardio" one is the key example of this. I can't think of a workout that does not include this. I am probably not helping things by doing around 8 hours of yard work each weekend, either. I went for a deep tissue massage this weekend to stack the odds in my favor. In every workout, Tanya is responsible for doing a slightly-lower impact version of each exercise. The idea is that if you are having a tough time with the exercise or you can't do the motion without endangering yourself (even if that is simply aggravating your knees), then you do what Tanya is doing. And Shaun reminds you of this many times. ...to stretch my calves and feet, and sometimes my quads. It's a single break of around 30 seconds, but it feels necessary for now as I am hitting a point somewhere in the workout where my calves, feet, and sometimes quads are so tight that I can't maintain good form. And, frankly, I would rather take that moment to stretch than step down my workout intensity. The initial moves in the workouts are supposed to be a warm up, but I do these first thing in the morning, so I might need to do a formal warm up for maximum results. For now, I want to see how well I can do this without any warm up beforehand. One can exercise in a way that feels challenging, exhaust themselves, and still reap minimal benefits. My chief concern is that I will end up just toning a lot, especially in my legs/core. I worry about maintaining or building muscle mass in my upper body. Time will tell. Week 1 of 5 done!